If you had asked me how I liked living in Houston 2 years ago, I would have probably given you a list of reasons why I missed New York. From the culture to the food to my friends, and even the subway (I’m a disaster behind the wheel)—there wasn’t a thing about the city that I didn’t miss. I truly believed that it was the city to live in; and to be honest, I still think it is in many ways. However, I have been embracing Houston more and more as time passes. Today, if you were to ask me how I like living in Houston, I would tell you about the house we bought, the great neighborhood we live in (even CNN Money thinks so), and our new Southern pace of life. I’d go on about the great cost of living and how the move has allowed us to have the time and money to travel. In the last 2 years, we’ve been to France, Australia, Peru, Japan, Taiwan, Belize, Guatemala, and Mexico. And that doesn’t even cover the countless trips we have taken within the US (including our West Texas road trip, mentioned here). This is something that living in New York could not have afforded us. So when we spent this past Labor Day weekend back in New York City (I’m getting to the Mango Frozen Yogurt part, I promise), I was singing a new tune and telling people how great Houston is. The trip did however reinforce my belief that Houston, while great, is still missing some things. And when I say “some things,” I mean a good ice cream place. For a place that gets as hot as it does in the summer, you would think good ice cream would be easy to find. It isn’t. 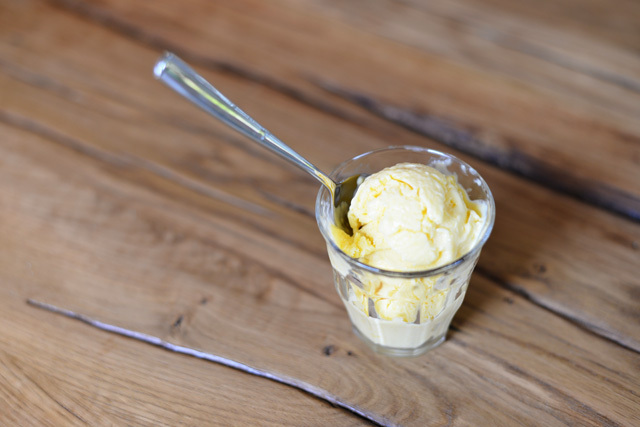 I haven’t found anything in Houston that comes close to the amazing ice cream and gelato places in New York (il laboratorio del gelato, anyone?) So alas, this is the summer that I broke down and bought an ice cream maker—because another hot summer without good ice cream just wasn’t an option. 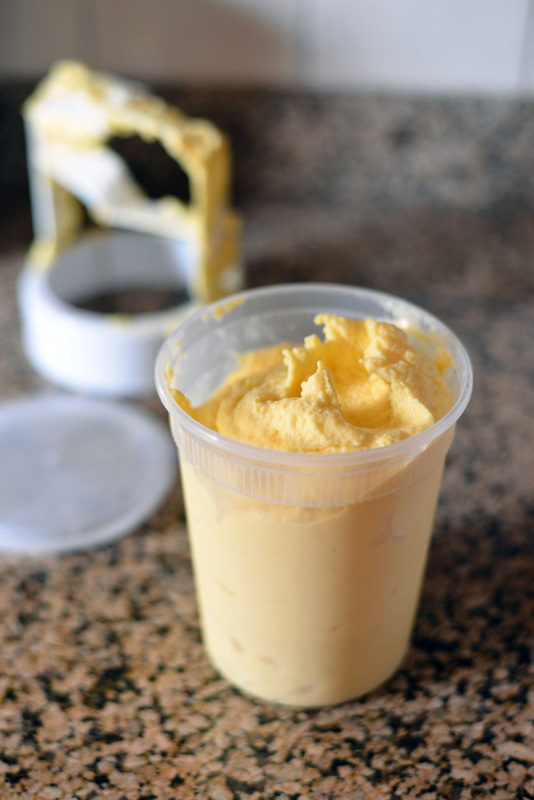 This mango frozen yogurt is one of the few concoctions that I have tried making with my new ice cream maker. All you need is a mango colored knife (see above/just kidding), mangoes, sugar, half a lime, salt, and Greek yogurt. All the ingredients get blended in the food processor for the ultimate no fuss dessert. No oven, no stove, and no excess heat in your kitchen. It is the perfect “I live in hot Houston” treat. 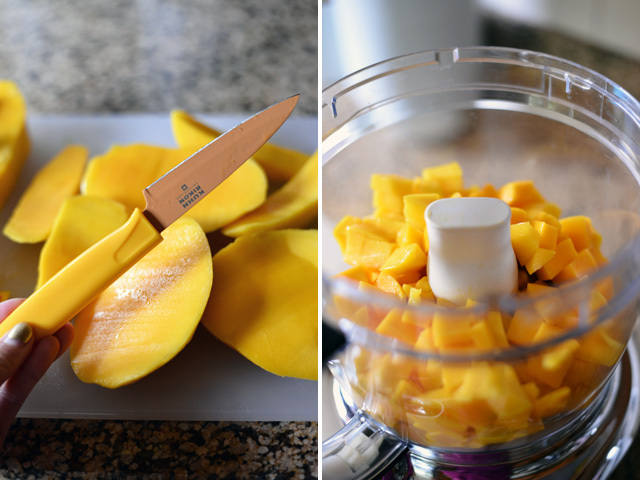 In a food processor, puree the diced mangoes until smooth. Add the sugar, lime juice, salt, and yogurt, and process until combined. Pour the mixture into a bowl or glass measuring cup, cover tightly, and chill in the refrigerator for at least 2 hours. 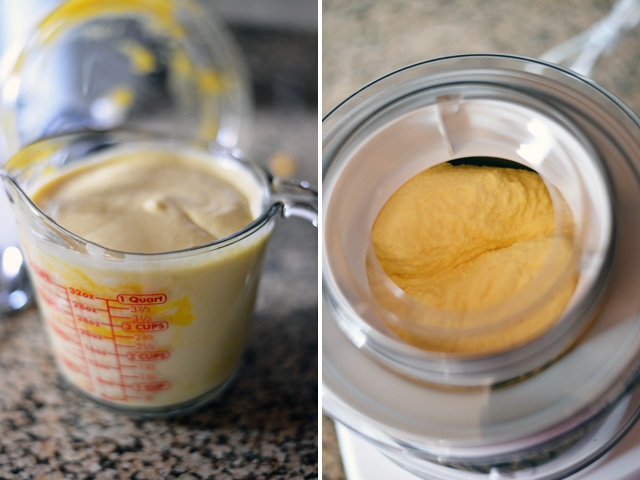 Then follow the instructions on your ice cream maker to freeze the mango frozen yogurt. Eat immediately or transfer the frozen yogurt to an airtight container and place in the freezer to firm up more.